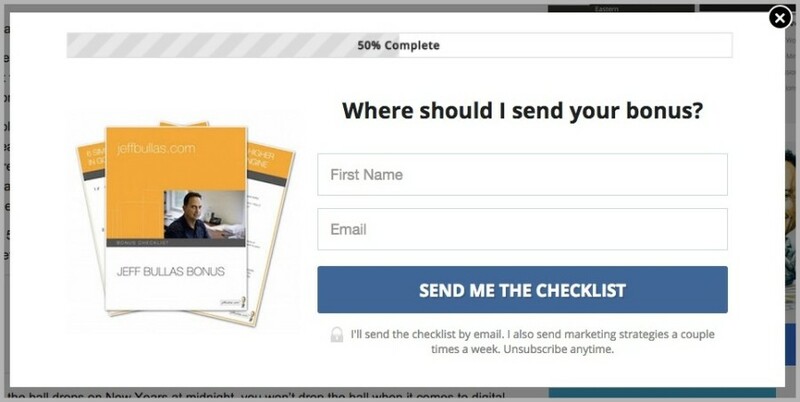 Increasing email conversions from your blog content. Someone’s inbox is sacred. You can talk to them away from the noise of the internet, in a place they are comfortable. A place where they trust you. Email marketing is the single most effective way to get repeat traffic, build a loyal fanbase, and get your readers to take action. It blows social media out of the water in engagement and is a hell of a lot cheaper than paying for attention on Google and Facebook. So the question is – What’s the most effective way to boost your email conversions? The answer is content upgrades. 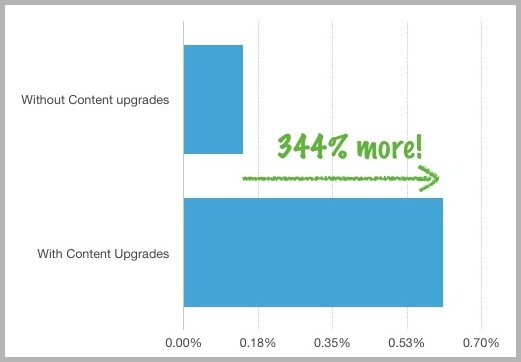 Today I’m going to walk through a step-by-step case study of implementing 4 content upgrades over the past 2 months on JeffBullas.com. Why you’re in a better position than Jeff to take advantage of this technique. A content upgrade, coined by Brian Dean of Backlinko, is a post-specific bonus given away in exchange for an email address in the post itself. Before you say, “Oh, I already give away a free ebook/report/video/course/thing-a-ma-bob,” note the words I italicized: this is not a sitewide, generic opt-in bribe. For example on the sidebar of this blog, Jeff is offering his ’8 key steps to blogging mastery book’. That’s not a content upgrade, because it’s offered site-wide and is not post-specific. When a reader opts-in, they’re sent the content upgrade for this post and added to the list. But the magic is in what the bonus is. 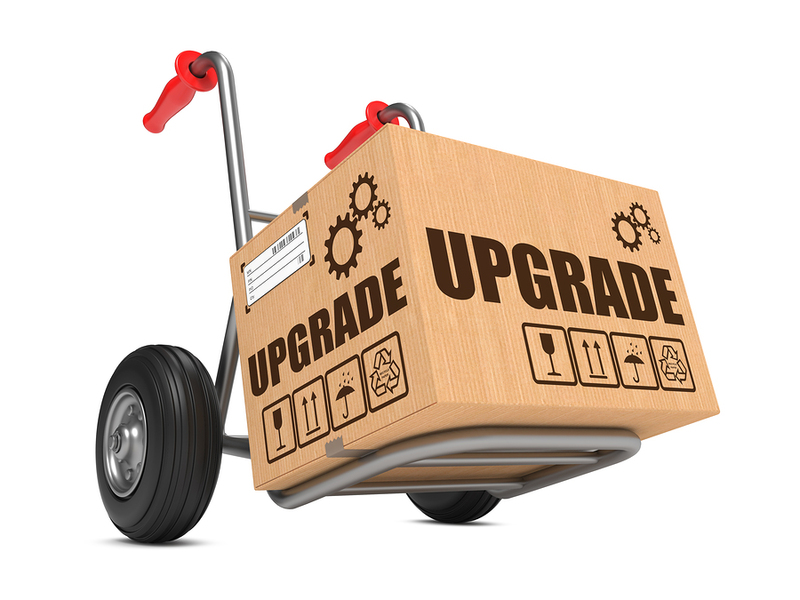 Everything magical about content upgrades is in the specificity. Let’s look at exactly what we offered in this 2015 strategy post. First, we turned the post into a checklist of the 15 steps, so it’s easy to actually use the strategies in the post and start ticking off action items one by one. 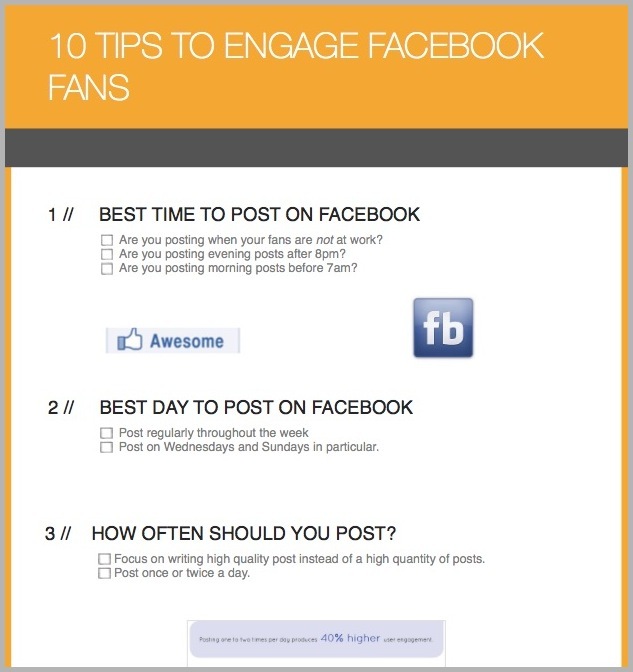 Checklists are a great way to make posts actionable, so they’re useful for your readers. And for you, the blogger, they don’t require coming up with new content. Just reduce your posts down into specific action steps. Next, we noticed a few of the tips in the post were about Facebook marketing. So a bonus on Facebook marketing makes sense. But instead of coming up with brand new content, we knew Jeff had a ton of content on Facebook already, so we found a way to leverage it. Honestly, that would probably have been enough. But we added one more bonus in because we already had it made: a checklist of how to rank higher in Google (It’s still relevant because one of the tips in the post was about SEO). 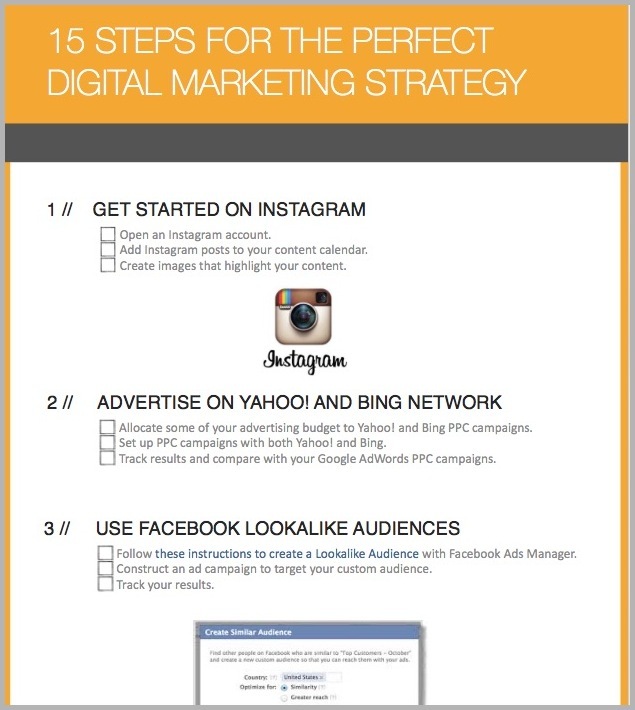 So if you’re the reader, you’re reading a post on 15 tips for a digital marketing strategy in 2015, that includes 3 tips on Facebook marketing and one tip on SEO. You see an offer for a free checklist of action steps for all 15 strategies, and how to increase engagement on Facebook, and rank higher in Google. Certainly a lot more compelling than a generic ask to “subscribe to my newsletter” and still more compelling than an ebook that is offered sitewide. Like I said, it’s all in how specific the bonus is to the post. That’s what makes the email conversions so high. In total, we implemented 4 content upgrades in the past 2 months. Note: For the conversion optimization nerds out there, although this wasn’t a formal A/B test (we are comparing conversions across different posts), the results had 99.99% significance (p value Site Content > All Pages in Google Analytics. 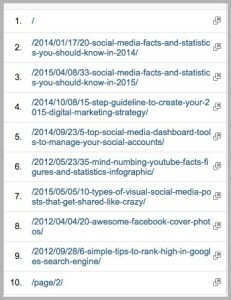 It should already organize your top pages by page views. Just be careful to select 3 or 6 months instead of 30 days so it doesn’t give too much weight to recent posts with a temporary traffic spike. JeffBullas.com is obviously popular, so when we did this for Jeff there were a bunch of options of posts with a ton of traffic. Choosing which to upgrade requires Step 2. Content upgrades work best on really in depth posts. The more depth the better. And, in my experience, how-to posts — the ones that teach people a process or technique — are the best. That’s because there’s really no reason to opt-in to get more information if the information you already got was basic, or worse, trite. On the other hand, if you’re reading an in depth guide on the Paleo diet with step by step diet and workout plans, and the author is offering recipes and printable take-to-the-gym cheatsheets, would you opt-in? Probably! 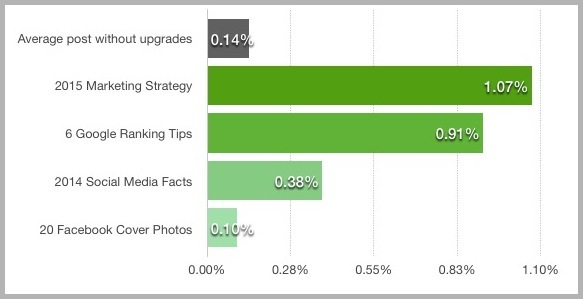 We saw this trend play out in our 4 content upgrades on Jeff’s blog. 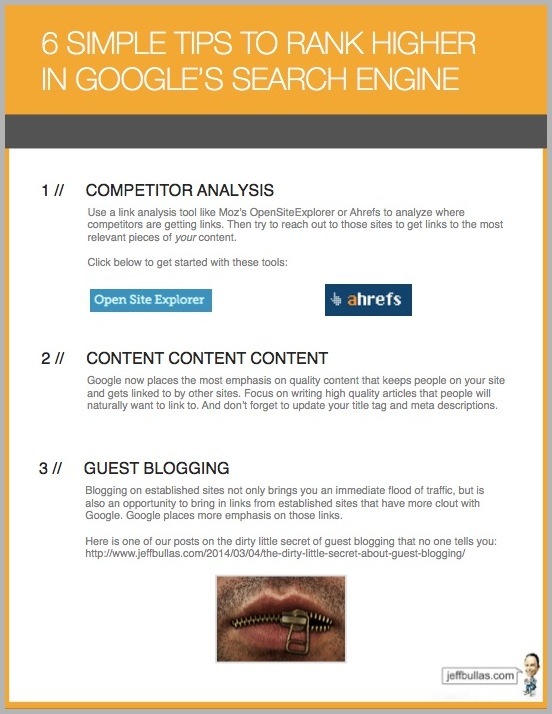 The two highest converting posts were the ones with the most how-to advice: building your marketing strategy for 2015 and ranking higher in Google. They helped readers achieve a goal. The two lowest converting posts were lists of facts (or photos) for reference, and, unsurprisingly, they didn’t do as well. So, if you already have a bunch of posts: focus on building upgrades for your most in depth posts first. What about new blogs? What if you’re just starting and don’t have a lot of posts with decent traffic. Focus your time writing in depth how-to style posts in your niche. Not only will that help get shares and links for traffic (because the content will be naturally better), but it’ll help you create obscenely high converting content upgrades. In fact, you might be thinking that right now. Don’t stress. You don’t need to make super elaborate content to get the benefit of content upgrades. You just need to think of small items of value that help your readers take the first step on the advice you’re giving. That can be a short screencast, links with more info, 10 example ideas, or, one of my favorites: A checklist of the advice in the post. Checklists are a huge win-win for content upgrades. Win for the reader: The reader wants to take action, but isn’t sure where to start. A checklist helps them with super clear, actionable steps. Win for you: You don’t have to write a ton more content, simply summarize your content into a step by step list. 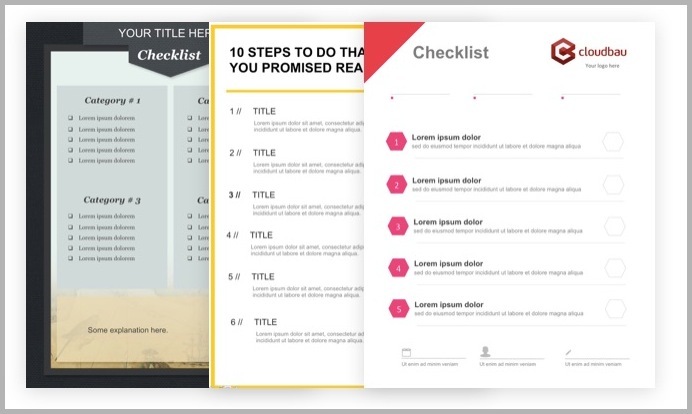 To help you quickly make checklists that look good, I’ve assembled a bonus area where I’m giving away 3 checklist templates, in PowerPoint, so you can customize them as much as you like.